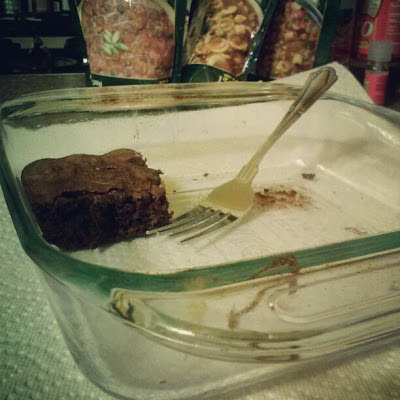 Life in the Pitts: These brownies are just a delicious side note. This is a Wordful Wednesday post. Because sometimes pictures need a thousand words. "Hey Kurt, I made you a brownie." "Wait, "A" brownie? Not a whole pan?" "...It's been a rough day." Yes, if you follow me on Instagram, you have already seen this photo. Such is life. And no, I don't think this is why I haven't lost all the baby weight. I'm thinking it's mostly genetics. And the fact that I've been looking at my Jillian Michaels DVD's and thinking "I should really start that," since October. These brownies are just a delicious side note. By the way, I am hosting a giveaway on the Life in the Pitts Facebook page right now. It's for Valentine's baby leg warmers. Have you entered? Here is the link!